I’m gonna warn you: This is a sappy tale (and it runs the risk of sounding self-serving). But I SWEAR, it’s 100% true. There is a homeless woman who bases herself in the Gateway Center, a business complex connected to Penn Station in Newark, NJ. To earn a living, she plays a violin for tips. The violin is pink, no doubt not of a great vintage, and she does not play it well. She’s gotten better in the year-plus that I’ve encountered her, but it’s still a screechy sound that deserves credit more for the effort than the facility. But I’ve grown to have a fondness for the crappy pink violin-playing lady. Tonight at the bar where I tend, we hosted a corporate party. As is often the case with pre-arranged events where the number of guests (and their appetites) can only be estimated, there was quite a bit of leftover food. After my shift ended, I grabbed a handful of bags from the kitchen and packed up five sacks of mixed sandwiches to give to homeless people on my way home (meanwhile, my boss was doing the same for some of the less-fortunate DTJC denizens). As I began my trek back to Newark, I wondered if I’d see the Pink Violin Lady. The first bag was relinquished in the Grove Street PATH station to a guy who looked like his homelessness was more of a lifestyle choice than circumstance, but I wasn’t about to start qualifying need. When I got back to Newark, rather than beeline through the Gateway (my usual route home), I detoured through the main thoroughfare of Penn Station, and as I suspected, there were plenty of potential recipients of the sandwiches. I gave one to a man settling in to sleep on the platform where I disembarked the train (a woman right behind me also gave him a dollar, so he had a good minute), another to what looked like a homeless vet in a wheelchair, and set the fourth next to a sleeping woman in the waiting area. I held onto the last sandwich and headed back up the escalator to the Gateway Center, hoping to see PVL, but she was nowhere to be found. In fact, the entire trek from Penn Station to the exit at Mulberry Street two winding blocks away, was unusually bereft of any stragglers, homeless or otherwise. It was around 10:30 pm as I walked out of the Gateway through the revolving door into the misty night, suddenly fuming that if the climate-changed weather were actually seasonable, this might be a light dusting of snow—beautiful snow—instead of rain, then becoming depressed that aside from decorations provided by the city and businesses, the only festive lighting I could find was coming from my own window, across the street and down the block, three stories above Dinosaur Bar-B-Que. Not to be morose, but honestly, for many reasons, Christmas 2015 has felt… lacking. As I crossed the intersection of Mulberry and Market Street, I glanced at the giant fake Christmas tree lit up outside of the Prudential Center, its rather sterile conical symmetry offset by the undeniable beauty of the thousands of sparkling lights wrapped around it. 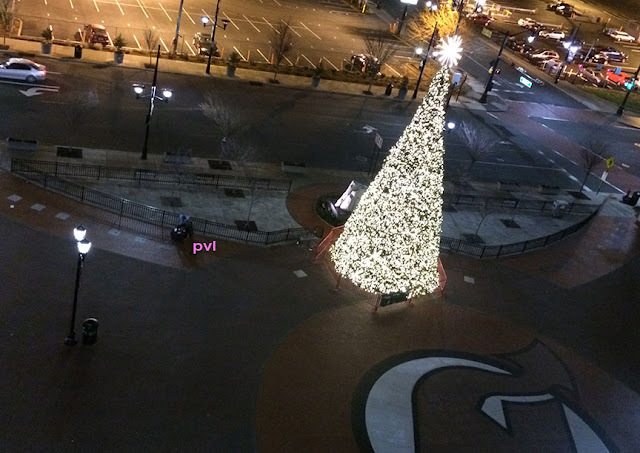 I looked onto the sprawling plaza, and (besides the giant sculpture of the hockey player), saw only one person, standing near the tree, gently rocking back and forth. Probably homeless, I figured. Maybe they’d want the last sandwich. And then I heard a familiar squawking. As I got closer, I saw the dirty pink instrument, and my happiness to see Pink Violin Lady was elevated exponentially when I realized that the music she was playing… was a Christmas carol. She was awkwardly bowing her way through “The First Noel.” Excited, I walked up and handed her the last bag of food, for which she thanked me and headed to the spot by the railing where presumably all of her worldly possessions were stationed. As she sat down to eat the sandwich, I felt a purely selfish pang of regret at my gesture, for one reason only: it made her stop playing. Because tonight, in the rain, with nobody else as an audience except me, that scratchy, off-key rendition of “The First Noel” may have been one of the most beautiful things I’ve ever heard.